Something Is Out There...: Just Got The Word! 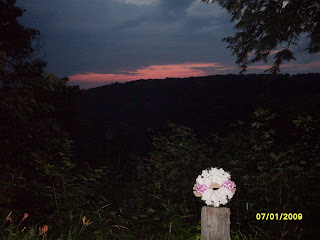 I found out today that theoverlook above Gretchen's Lock will now be called the Dustin Huffman Memorial Overlook. 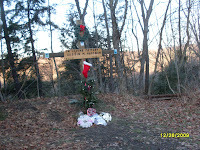 Tragically, Dustin Huffman was killed in a fall on June 30 of 2009 very close to the look out. The cross pictured above is far closer to the actual spot. The cross was made by his best friend, Tyler, in loving memory of Dustin. Dustin was only 17 years old though he left his mark on this world as permanently as if he were 80 when he died. Please become a friend or a fan! Rest In Peace Dustin Huffman. You are so very missed. Some, like me, are filled with regret that we never got to know you when we had the chance. WHERE WILL YOUR BEST FRIEND BE?